The LYNX II automated EM tissue processor provides a compact and intelligent system for automatically processing biological specimens for the electron microscope, high resolution light microscope examination (EM) and routine Histology processing (HP). The new LYNX II automated EM tissue processor has been developed as the successor to the renowned LYNX automated EM tissue processor, designed and produced in Australia during the 1970’s and incorporates many new capabilities for optional processing of large samples for histology. The LYNX II automated EM tissue processor can now accommodate 24 reagent vials for Electron Microscopy (EM) processing and 12 larger reagent vials for Histology Processing and is configured with two independently controlled heating/cooling stations. A single unit, housing both the processing and control functions prepares the specimen from pre-fixation, dehydration through to infiltration with embedding medium under a wide range of time, temperature, pressure, vacuum and agitation conditions. The system enables all processing protocols to be fully automated, for example Renal Biopsies both rapid and routine diagnostic analysis, SEM sample preparation, Histology processing, Grid Staining and Immunohistochemistry investigations. For more information on the LYNX II Automatic tissue processor, Please Contact us. All reagents typically used for specimen preparation for electron and high resolution light microscopy and routine Histology processing can be safely used in the LYNX II automated EM tissue processor tissue processor. MS LYNX II tissue processor specimen carriers. Each of the reagent vials can be independently programmed using the membrane keyboard and display. Up to 20 programs (10 for EM and 10 for HP) can be permanently stored and protection, in the event of mains power failure is ensured by a lithium battery. A facility for remote alarm is provided in the event of mains power failure or processor malfunction and a rechargeable battery ensures that the vials revert to the raised position so that the specimens are protected from degradation. An output for a printer is available for hard copy records where required. A capacity of only 40 characters is required enabling simple printer equipment to be used. The modular design of the unit provides easy service access and the facility for an exchange program. When an error occurs, the unit is pre-programmed to identify the source of the fault reducing un-necessary down time. To safeguard the environment from the possibility of reagent contamination the unit has a built-in fume extraction system ducted to an external flexible hose. Any vapours generated from Osmium Tetroxide, Glutaraldehyde, Paraformaldehyde, Propylene Oxide, Ethyl Alcohol, Acetone, Formalin, Xylene and resin components (Spurr’s, Lowicryls, and Paraffin etc.) are consequently safely removed to the external environment. Each reagent vial is sealed during processing reducing the evaporation rate of the reagents and all accessories in contact with hazardous reagents are disposable. 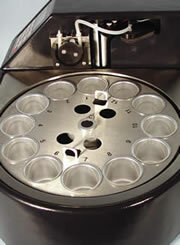 Two reagent carousels are available, a 24 position carousel for holding Electron Microscopy reagents (20mL/vial) or a 12 position carousel for Histology Processing reagents (100mL/vial). Each vial has a flange for ease of handling and are available in either plastic or aluminium for optimal chemical compatibility and heat transfer. The vials may mixed on the one carousel for optimal processing. The Lynx II automated tissue processor has a built-in sensor to detect that the correct reagent vial types are installed prior to starting a run. Vertical agitation of 5mm at the rate of 2.5mm/sec at 1 second intervals ensures adequate agitation/filtration rates. If vacuum infiltration is selected, agitation will be applied for 5 seconds followed by 40 seconds of vacuum. The LYNX II automated EM tissue processor provides two independent, identical heating/cooling stations (HCS). Each HCS is heated or cooled by a Peltier module which has its own temperature sensor. One HCS is located at the sample processing station and the second is located one position prior to the sample processing station. This arrangement allows for the pre- heating or pre – cooling of the reagent where the reagents are arranged in a sequential, contiguous manner. Each HCS can be programmed from 4°C to 65°C, ±2°C measured on the surface of the heating/cooling station. The set point at the HCS surface is reached within 7 minutes of the arrival of the reagent at the processing station. The LYNX II automated EM tissue processor incorporates an integral fume extraction system which can be directed to a fume hood or laboratory fume exhaust system. During processing, all reagent vials, with the exception of the current processing station are sealed, thus minimizing reagent fumes within the enclosed system. The acrylic lid is fitted with an interlock which will prevent the initiation of a program if the lid is not correctly locked. Service software is provided so that the system can be operated with the lid open. 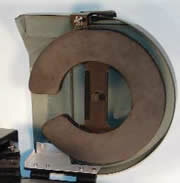 The LYNX II automated EM tissue processor contains a small internal battery (that is capable of moving the sample from the up position to the down position and to move the carousel to the next reagent position at least three times without being re-charged) to preserve the sample during a power outage. When the electronics in the LYNX II automated EM tissue processor detect the possibility of a power failure, the LYNX II automated EM tissue processor will shut power to the Peltier elements at both heating/ cooling stations and lower the samples into a reagent container. If the LYNX II automated EM tissue processor was in the process of transferring the samples to the next processing station at the stage of power failure, the carousel will continue to the next processing station and the specimens lowered into the vial. The time when the power failure occurred will be recorded and the unit will go into standby mode. When the power is restored and maintained for at least 30 seconds, LYNX II automated EM tissue processor will resume the processing cycle. As LYNX II automated EM tissue processor resumes, the station time and countdown does not resume until the heating/cooling stations have reached the desired temperatures. The station time countdown does not begin for an additional 60 minutes if the temperature at the processing station or at the previous station was above 55°C during an HP run. This ensures that the paraffin at either of the two stations completely melts before moving to the next station.